going to spend tonight just relaxing and being lazy. Maybe watch a Christmas movie or two. And don't forget to check out my shop! 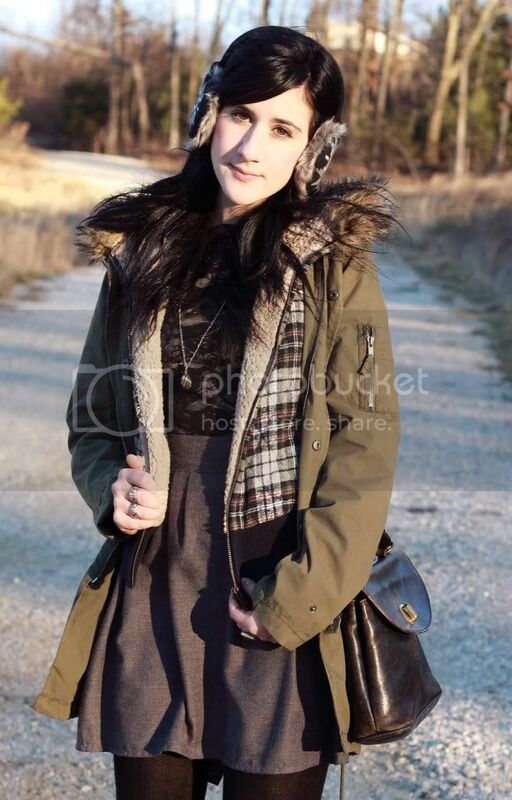 wearing: BDG anorak; f21 vest; thrifted top & skirt & bag; Lola wedges; Asos earmuffs. Cute outfit!!! :D I love your ear muffs! I need a pair!!! You're looking particulary flawless today :) and of course, i love the earmuffs. I love the grey skirt - it looks like just the right amount of heaviness for colder weather. love the earmuffs, a nice alternative to a hat and hat-hair. White Christmas is on AMC right now, definitely helping get into the Christmas spirit! Love all the layers and the earmuffs! hey sweet thanks so much for coming by to my blog :) love the comment! it makes me happy :D please come by again anytime! you look amazing. i love the outfit. i reallllly like your skirt !! you look pretty. i love your outfit, of course. the layering's very chic. my favorite is the parka.great piece!! That lace shirt is very nice. I like how you mixed fancy and casual pieces. You seem cozy. This is the most perfect winter look, I love all of the layers. Army green is the best color for a coat! such an amazing mix of textures and prints in this outfit! so perfect. It's cold all around the country! I'm freezing this weekend. But you lovely, I admire that you were able to get some shots outside. Stay warm! Love the earmuffs! I'm longing for weather like yours, in my dreams I guess ^^ ... loved the lace top under all layers a feminine perfect touch! As usual I adore everything you're wearing, but I think your earmuffs really complete the whole look for me, haha. :) They're so cute! Christmas movies sound like a plan to me right now. I adore your shirt and the skirt is pretty wonderful, too! Hope you will check out the giveaway I am hosting this week. That is one pair of cute earmuffs! I've never seen them like that before. And that is a great coat. I love the hoot. Your blog is pretentious crap. Convincing yourself and others day in and day out that you are a good person and worth all the things you have is surely exhausting, grotesque to witness, and backwards. After much thought, I’ve realized that your logic is slightly flawed. Actually, it’s rather selfish. instead of prancing through the streets and taking pictures of yourself in whimsical fuckery, or you know, do something meaningful in your day that does something positive for someone other than your lack-of-a-real-job self. Self-love is a great thing, but it shouldn’t entail nothing but material consumption and narcissism. When can you manage to stop buying and buying clothes, is the question. Your blog is pretentious crap. Convincing yourself and others day in and day out that you are a good person and worth all the things you have is surely exhausting, grotesque to witness, and backwards. After much thought, I’ve realized that your logic is slightly flawed. Actually, it’s rather selfish. instead of prancing through the streets and taking pictures of yourself in whimsicle fuckery, or you know, do something meaningful in your day that does something positive for someone other than your lack-of-a-real-job self. Self-love is a great thing, but it shouldn’t entail nothing but material consumption and narcissism. When can you manage to stop buying and buying clothes, is the question. i adore this look! the lace is just lovely. just stumbled in and LOVE this outfit SO SO much, cutest little bundle-up-ins is what! pea ess: um, just have to say "anon" up there needs to stop sippin' the hateorade, geesh! Love this outfit - all the layers and earmuffs - the kind of thing I should be wearing under current weather conditions. Also adore the parka. Such a beautiful outfit! It's cold here as well, but I like it because it's an excuse to wear layers :) You look so cute! Gorgeous designs... awesome..perfect dress for this winter.. I love all these layers! This is just plain perfect ♥ Looking great! stumbled across your blog today..
LOVE it, your wardrobe choices are beautiful. I can't even imagine what it feels like to be in such cold weather! love how you layered this outfit. It looks stylish instead of bulky. That high waisted skirt is my fave! Cute pics! Really love that layering and especially your earmuffs! First off, LOVE those earmuffs! How fun! and I also enjoy all your texture mixing in this look! lace, fur, cotton, and fuzzy wool on the side?! Amazing! so cute!!!! we follow you!!! the parka looks stylish with everything! love this outffit too, the boots are gorgeous!! & I just love the skirt and the bag! Thanks for your lovely comment !. You're just too perfect at layering - love the earmuffs! Really cute outfit babe!!!! Is really cold outside and you wear perfect outfit for this weather, you're fab!!! 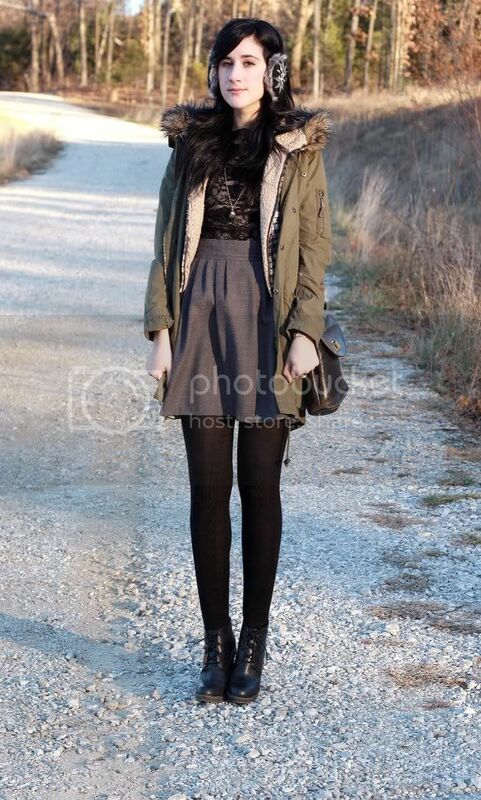 Adorable use of layering, I love your style, you're a real inspiration! Great outfit! Nice layering. 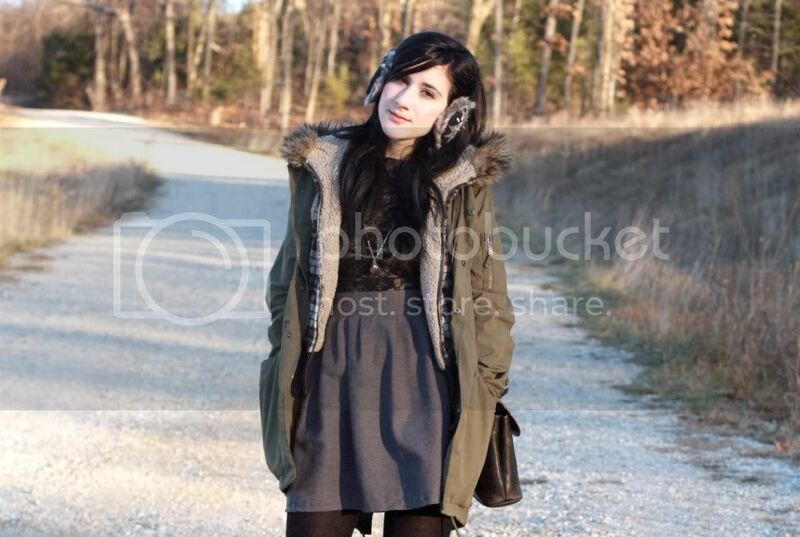 I love the parka and the cute cute cute earmuffs! you are definitely one of my favourite bloggers. this outfit is amazing! i love how you pull off so many looks. i'd look so ridiculous in ear muffs, but you you fab. Great layering and I love that coat! Stay warm Bonnie! It's starting to get pretty cold where I am too. Anyway your earmuffs are too cute!! shop, really?! now you want to make money off your readers. wow. Im not sure who is more ignorant - you or those who continue to follow you. I love your earmuffs! They look so cute and warm!! It's starting to get cold here as well, and I feel like lounging around in my room all day and never leaving the heating :D You look absolutely adorable in your picture; I love your outfit and the color palette! your hair looks sooo dead. get a haircut girl asap. you look so adorable, bonnie! how i love your style and blog at the same time! the ear muffs look so pretty fit with your outfit! love this cute layered look!! love it! These earmuffs are so cute ! When did you get these ear muffs? Oh just give it a rest. POINTLESS. I love all of your shoes, so jealous!